Emperor of the Western Roman Empire (395-423). The laws of Arcadius, the Eastern emperor, regarding the Jews were signed also by Honorius, and applied at first equally to the Western Empire. But Honorius later promulgated independent laws in reference to them, mostly with hostile intent. He annulled the decree exempting the Jews of Apulia and Calabria from holding curial offices ("Codex Theodosianus," xii. 1, § 10). In 396 he assured state protection to the "illustrious" patriarch of the Jews, but in a law dated from Milan, April 11, 399, he designated the patriarch as a "robber of the Jews," forbade the payment of the patriarch's tax, and seized for the royal treasury the suṃ already collected. It is possible that he merely intended thereby to erect a barrier between his dominions and those of his brother Arcadius. Five years later (July 25, 404), however, he again permitted as a special favor the collection of the patriarch's tax (ib. xvi. 8, § 17). On April 22, 404, he decreed at Rome that Jews and Samaritans should not be admitted into the army (ib. xvi. 8, § 16), a decree that the Jews certainly did not regard as a deprivation, but as a privilege. From that time on the laws of the Western empire were in general more favorable than those of the Eastern. In 409 the authorities were enjoined to respect the Sabbath of the Jews, and neither to call them into court nor impose work upon them on that day (ib. ii. 8, § 3): but in 412 this law was changed. 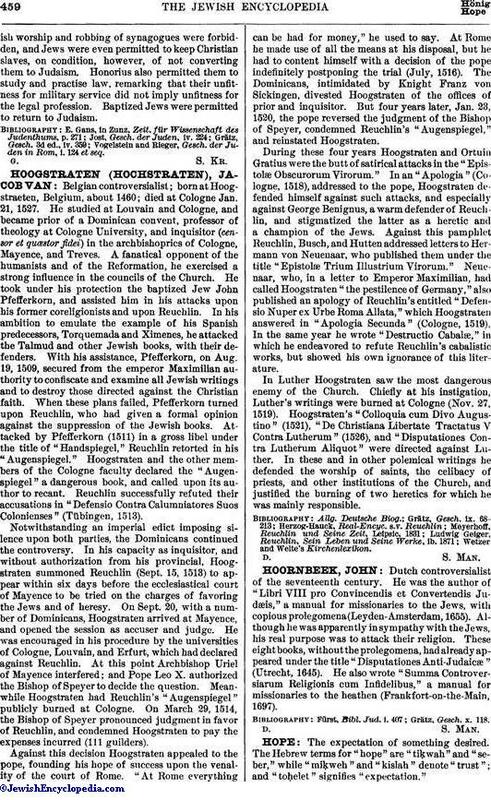 At the same time disturbance of the Jewishworship and robbing of synagogues were forbidden, and Jews were even permitted to keep Christian slaves, on condition, however, of not converting them to Judaism. Honorius also permitted them to study and practise law, remarking that their unfitness for military service did not imply unfitness for the legal profession. 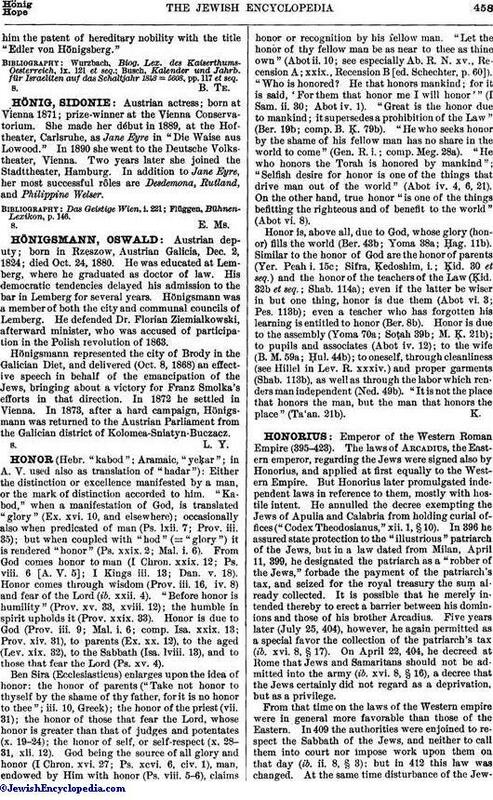 Baptized Jews were permitted to return to Judaism. Vogelstein and Rieger, Gesch. der Juden in Rom, i. 124 et seq.